Unpacking Memories – No Nonsense, Nathan! No Nonsense Nathan is a charming new book from Gladstone Publishing that teaches kids all about the art of compromise and sharing. Two to seven year olds will be able to relate to Nathan, who spends his week not wanting to share or cooperate. When he discovers a magical way to turn everyone to stone and be free to do what he wants, he also discovers that isolating himself can be lonely, and compromise can be fun. 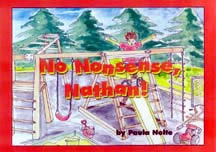 “This is the first in a series of books about Nathan and his friends,” explained author Paula Nolte. This book series is designed not only to teach life lessons in an engaging way, but also to open up a dialogs between child and parent. Nolte, who’s been a teacher for 10 years, has seen first hand how challenging it is to raise a little one and work outside the home. Nolte is multi-talented. Not only is she a teacher and author, but she has also done the illustrations for the book. Nolte’s illustrations are delightful and rich with detail. She recently began giving creative writing workshops at elementary schools around the Tri-State area. Children not only get to meet the author, but they learn all about what is takes to produce a book. “What we’ve done is go into the classroom and give children an illustration from the book.” Nolte said. “Children are asked to observe the picture and then write their own tale of what they feel is happening. “Then, I teach the kids all about the fine art of editing. In the end, we take the pages they have created and publish their book, which resides in the school’s library,” she said. “The children just love it!” She also autographs the student’s copies of Non Nonsense Nathan and delights in fielding questions from young future writers. It all started with an interview in the Philadelphia Inquirer. I received over 30 emails from first-time writers looking to get published. But, one of these emails came from “Love Krissy”, a teacher in Harrison Township. It was her class the school program was launched. Somewhere in the many boxes is stored the contributions from her class as they described Nathan or wrote themselves into the story. Hmmm, how long will it take me to find them?